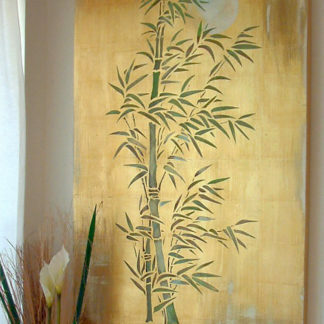 View cart “Oversize Bamboo & Moon Stencil” has been added to your cart. 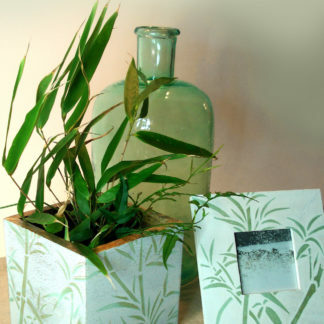 The Large Chinese Bamboo Stencil is an elegant motif for creating centre piece wall features, panels and pictures. Bamboo is a popular design choice amongst artists and designers because its striking formation has instant appeal in a wide variety of settings. 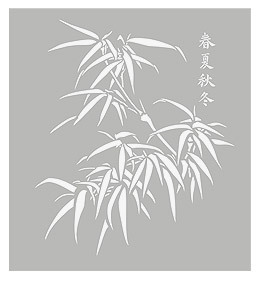 The Large Chinese Bamboo Stencil is a single sheet one layer stencil of an elegant bamboo motif with additional Chinese calligraphy motifs for Spring, Summer, Autumn, Winter. See size and layout specifications below. 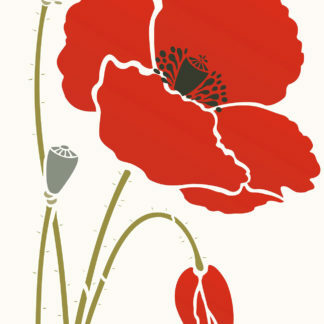 Stencil in different green tones, ochres and browns on a range of coloured backgrounds or use traditional Chinese colours of gold on black or vermilion red backgrounds, or black on gold or red backgrounds. Either muted or strongly contrasting colour palettes suit this design which has both a contemporary and ageless character. Above top – the Large Chinese Bamboo Stencil on a light brown to off-white graduated background stencilled with a ‘two-tone’ technique in Latte and Coffee Bean Stencil Paint, with calligraphy in Jet Black Stencil Paint. See bottom right for paint and stencil techniques. 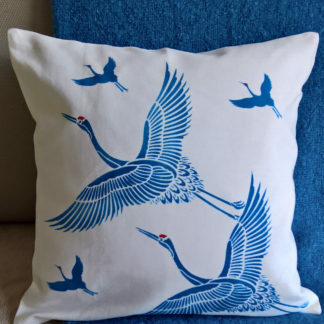 Above left – the Large Chinese Bamboo Stencil in Verbena, Oasis and Woodland Stencil Paints, with calligraphy in Atlantic Blue Stencil Paint. 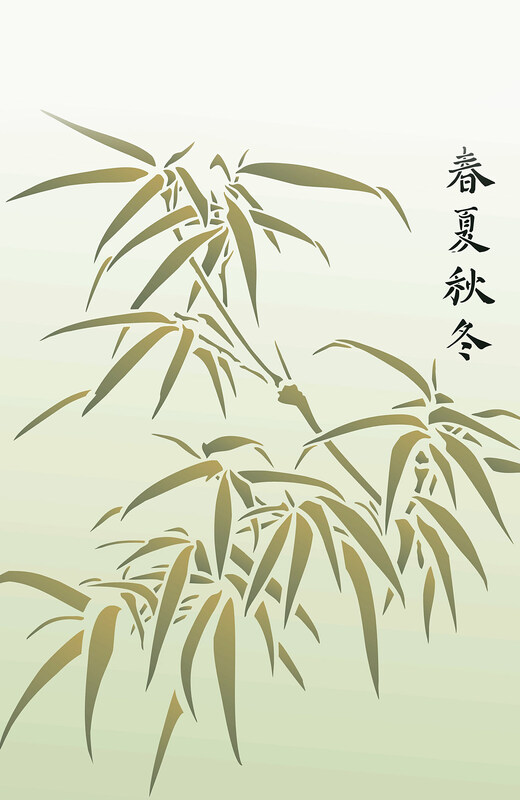 The Oversize Bamboo and Moon Stencil – a strong upright oversize bamboo motif with moon stencil. 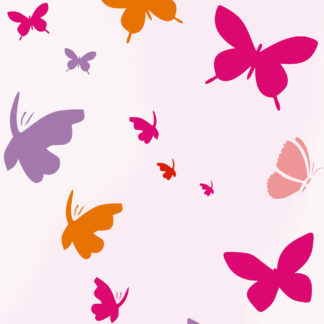 The Bamboo and Butterfly Stencil – small motif stencil. 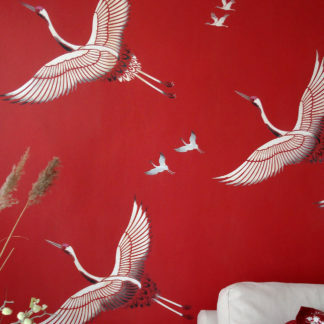 The Bamboo and Bird Stencil – small motif stencil – use these two as a pair or individually. Also see the Weeping Willow Stencils. Use our Stencil Rollers and Stencil Sponges for ease of application. 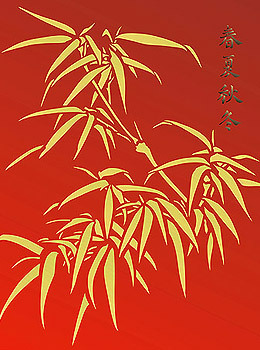 Above – the Large Chinese Bamboo Stencil on a vermilion to burnt sienna graduated background, stencilled in Nougat and Butterscotch, with calligraphy in Coffee Bean – all over-stencilled with Antique Gold Metallic Stencil Paint. Finish with Acrylic Eggshell Varnish for a lacquer effect. (See notes below for graduated painting techniques). 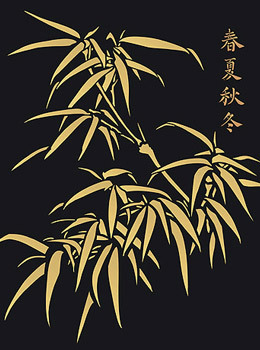 Above – the Large Chinese Bamboo Stencil on a black background, stencilled in Butterscotch and Latte Stencil Paints. Finish with Acrylic Eggshell Varnish for a lacquer effect. 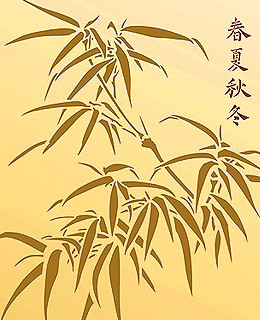 Above – the Large Chinese Bamboo Stencil on an ochre to cream graduated background, stencilled in Grassland, Latte and Chocolat Stencil Paints. Calligraphy stencilled in Agapanthus Stencil Paint. (See notes below for graduated painting techniques). 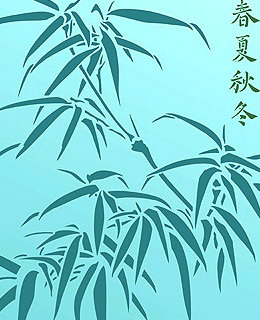 Above – the Large Chinese Bamboo Stencil in Cyan, Sea Green and Emerald Forest Stencil Paint on an aqua to turquoise graduated background. Graduated painted backgrounds can be achieved by using two similar tones of emulsion paint (latex) and a tinted varnish glaze over the top. 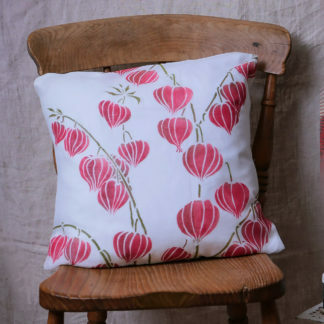 This technique will not work with radically different colours – keep the tones similar so mixing is easier. Mix a third of each colour together to create a mid-tone colour and paint the wall in either three horizontal bands or in three bands on a slight diagonal. The bands should go from dark to light, brushing the colours lightly over each other where the different colours meet to create as softer join as possible. Keep strokes long, smooth and even. Mix a varnish glaze using 2/3rd Acrylic Matt Varnish, 1/3rd Acrylic Scumble Glaze. Add a little water if the glaze is much thicker than the consistency of double cream. Tint the glaze with several drops of Universal Tinter to create a transparent glaze a couple of shades deeper than the middle tone of your painted wall. Brush the glaze over the wall and soften in long smooth strokes using a soft brush. Repeated layers of the tinted varnish glaze will serve to blend and soften the joins of the different colours. Using two colours stencil the cut out shapes of the stencil with one colour and then over-stencil a part of each cut out shape with the second colour, blending as you go. This creates depth and a more 3-dimensional feel. 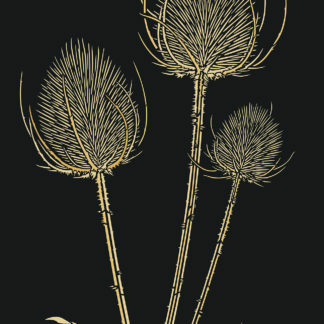 This single sheet one layer stencil is made of 125 micron mylar. The bamboo motif measures approximately 59cm (23″) deep x 50cm (19 3/4″) across at widest points. The four calligraphy motifs together measure 18cm (7″) deep x 4.5cm (1 3/4″) wide. On a sheet 60cm (23 1/2″) wide x 65cm (25 1/2″) deep. 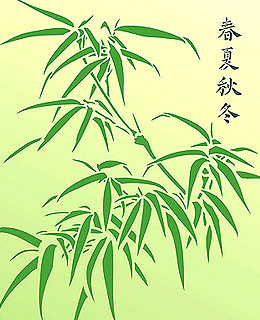 Left – the layout of the Large Chinese Bamboo Stencil.